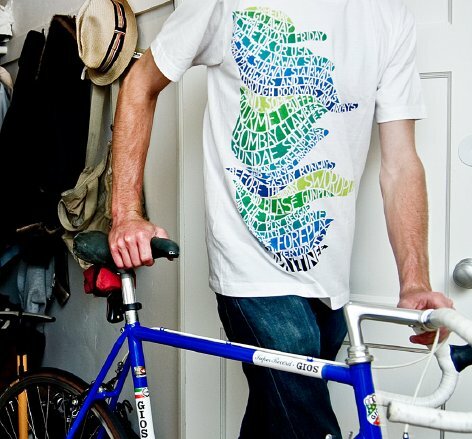 Does your t-shirt lower your carbon footprint and improve air quality and reduce your utility bill? This t-shirt does. This shirt is part of the Holiday Matinee Artist Series, which means they donate 100% of proceeds from every t-shirt sold to Plant-It 2020. That means every time you buy a shirt you plant, maintain, and protect twenty trees. It’s that simple, plus all shirts are tag-free and 100% organic. How’s that for a designy do-good-feel-good gift? About the artist: Nikki Farquharson is a left-handed designer living in London, England. She’s obsessed with letters, lines, patterns, shapes and colors. For this project, Nikki wrote a poem where every word ends in the same sound of Holiday Matinee. I’m also a big fan of the professional dreamer tee! Great new stuff from Holiday Matinee. Unique idea. I wonder how many trees this has helped plant so far? That’s me! And my bike! Yes!